Sierra was a feral dog left to fend for herself in the east mountains. Through several miracles and a lot of luck she became a great companion for a family that was willing to give her the love she needed to allow her to trust and want to be around humans. 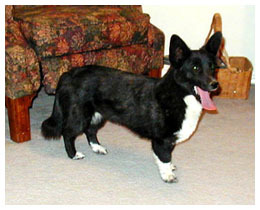 Sierra, a Corgi mix, was born in the East Mountains and had no human contact until she was regularly chased off by a rancher because she and her litter mates were herding his horses. The rancher was going to shoot them and in her first near miss with death she and the others were trapped by a rescue group and taken to various shelters or foster homes. Sierra's second brush with death was at the shelter that determined she was beyond help due to extreme lack of socialization and would have to be euthanized. Through a series of rescue groups and advocates she ended up being saved and came to Second Chance Animal Rescue. She lived in the back yard of her foster mom's house for two months before she ventured in through the dog door and she learned about being in a house and started getting used to humans. She was still very shy when a call came that someone was interested in meeting her. They came to visit and there was an instant connection with Sierra and Kim, her potential adopter. Sierra even allowed Kim to touch her upon their first meeting. Kim used the services offered from A Fresh Perspective Training when someone adopts a dog from SCAR. Because of Sierra's situation she had more involved training at her home and with their help Sierra bloomed into an amazing companion for Kim and her family. Sierra went from being a dog that would cower out of fear if a human came near her to a dog that loves walks, rides in the car, and sleeping with her humans. Last year Sierra helped welcome a new addition to the home, a baby girl named Kaitlyn, and Sierra has been her protector since.